These presentation slides 47901 are complete compatible with Google Slides. Simple download PPTX and open the template in Google Slides. 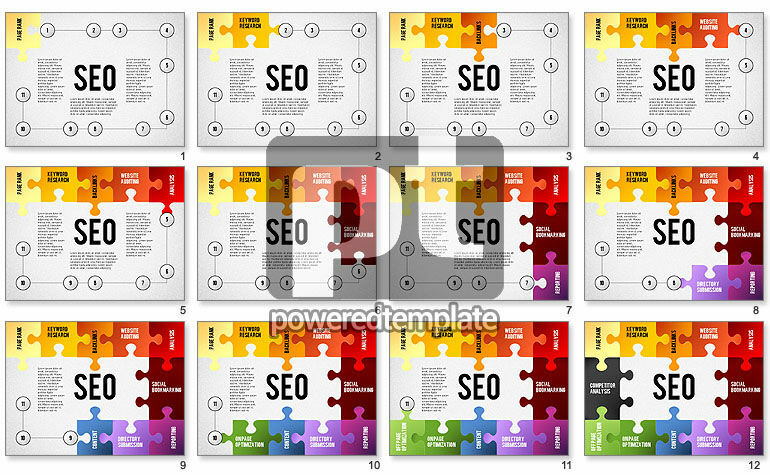 Don’t miss a chance to enjoy this magnificent SEO puzzle template. Created in a stylish colorful way, it may be used in many various presentations dedicated to SEO, website auditing, social analysis, bookmarking, promotion, planning and so on. The idea of its style is puzzle, which is fulfilled with every new item, so don’t miss a chance to use this idea to colorize your great presentation.